From our Unique Beaded Fringe Collection (trims under 1 1/2" long)"Pennsylvania Pewter " combines sparkling soft warm pewter gray in a fabulous beaded fringe trim in a long 5" variegated length. 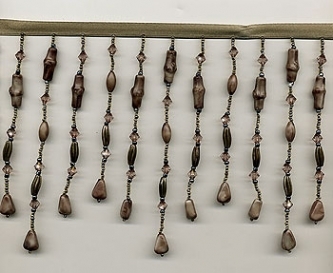 The colors are warm grey, pale silver gray and small seed beads in a very subtle shade of dark blue gray (Be sure that you click above to view the larger image of this trim so that you can see some of the detail a little better). This is a high quality, very full beaded fringe with exceptional detail and craftsmanship. The longest beaded stands are 5 " long not including the 3/8 " grey satin ribbon. Perfect for apparel or home decor.